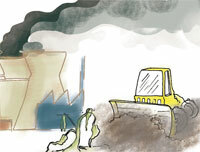 We know that air pollution in Indian cities is hazardous. We need urgent solutions to cut emissions from all sources so that we do not lose this critical health battle. In Delhi and its surrounding region, for instance, we know that air toxins are a clear and present danger. The tiny particles of PM 2.5 that can go deep into lungs and cause serous health impairment are several times higher than standards during winters. In addition, nitrogen oxide (NOx) levels are rising because of the burning of diesel and coal. A new danger is lurking: ozone, a deadly pollutant, which targets lungs and is linked to high NOx emissions. We need to find urgent solutions. We know that one big part of the solution is to reinvent mobility and to phase out diesel use in vehicles. Another part of the solution is to phase out coal use in thermal power stations in densely polluted areas and to run them on relatively cleaner natural gas. Gas-based power stations have no particulate emissions and much lower NOx emissions. They can achieve 20 ppm NOx levels where coal-based power stations have no standards but emit between 100 ppm and 300 ppm. Coal-based power plants are regulated based on their stack height—the assumption is that the higher the dispersion of pollutants, the lesser the problem. But this worked when there was cleaner air for dilution. It does not work now. So the transition done in the case of vehicles to compressed natural gas (CNG), which helped the city leapfrog to cleaner air, is needed in power plants as well. This has been accepted. So, for the past few years, Delhi and its surrounding region have invested in building gas-based power plants. Delhi has shut down its coal-based IP power plant and is waiting to close the Rajghat power station. It has built Pragati, Bawana and Rithala plants. The combined installed capacity of these gas-based power plants is over 1,730 MW. In addition, the city is ready to invest in a plant of 700 MW at Bamnoli and to convert three units of the Badarpur power plant to gas. But there is a small hitch. There is no gas to run these commissioned plants. The country, they say, has run out of gas. Oops! This is exactly what was said over a decade ago when demand was raised for natural gas to run vehicles. Then, gas became available; there was talk about huge finds in the Krishna-Godavari basin. But now the wells have mysteriously dried up, gone kaput. Or so it is said. According to the Ministry of Petroleum and Natural Gas (MoPNG), India’s gas output is expected to fall by a whopping 35 per cent in this fiscal and another 12 per cent next year. Nobody cares to explain this. But it is clear that the new monopoly player—Reliance Industries—is not playing ball. The Comptroller and Auditor General of India’s (CAG’s) report on hydrocarbon production sharing contracts has a damning indictment of the loss to the exchequer in the allotment of the gas field and of the manner in which the capital costs have been rigged to reduce the sharing with government. The widely held belief is that exploration is down and gas is drying up because Reliance Industries wants prices to be hiked. It wants control over the sale and allocation of gas. Its partner in this is oil major BP, which picked up 30 per cent stake in it for US $7.2 billion. Clearly, this investment would not have been made if the fields were dud. In coal the story is same and different. It is said that thermal power plants are running out of coal because environment and forest clearances are holding up projects. So there is a clamour to open up more forests to private players. The leaked draft report of CAG on allocation of coal blocks reveals dirty secrets. What is worse is that Coal India, which produces 90 per cent of India’s black gold, has under its control some 200,000 hectares (ha) of mine lease area, including 55,000 ha of forest land. Still it produces only about 500 million tonnes annually. So it is convenient for all to not fix this supply problem, but ask for even more forests to be mined. The environment is hurt in both ways—by the unavailability of natural gas, which would have cleaned up emissions; and by the demand to destroy more forests, surrounding water bodies and livelihoods of people, because of our inability to use the existing coal fields optimally. The issue also hides the serious problem of pricing power at affordable levels, given the rising price of coal and gas. Currently, imported and re-liquified gas price is touching US $17-18 mmscd. Imported coal price has also spiralled out of control. In this scenario, the options are as follows: one, to maximise domestic resources and operate them at tight capital and operational costs; and two, pay for higher raw material costs in power generation by investing in reducing inefficiencies, including losses in transmission. As yet, there is little evidence that we are moving in any of these directions. The only evidence is that the big monopolies are taking us for a ride with disastrous consequences for our health and environment. Another aspect to this issue is the Technology adopted by Coal based Power Plants. The environment friendly Super Critical technology is not fully adopted. Coal India is giving preference to the ones based on this technology but why is not there any regulation to upgrade the year old power plants with the latest one. There should also be strict guideline and action plan within which we can phase out the old power plants with new ones. Sunita, you only got one point right, i.e. gas should replace coal as much as possible. Surprisingly you got many points wrong. (1)The country may not mind to bring/import gas to produce power in Delhi to keep the lungs of Sunita Narains healthy; but the country can not avoid coal-based power stations in tribal areas like Talchir to lighten the study books of tribal children. You know better, most of them were born in rooms without electrical power. By the way, no body is talking about not 'cleaning' the coal-power-process. (2)Yes like oil, country is running shortage of gas. Yes like oil, it would have run into more shortages, but for the giant Dhirubhai discovery. But to ascribe the shortage due to deliberate capping efforts of RIL is pointing finger without looking at other fingers. May be you need to know geology to improve your opinion on this. (3)I don't have to be an expert to understand that monopoly whether public or private is bad. The opposite of monopoly is competition. Our past vs. present experience in aviation, communication, oil refining sectors say a lot. (4) Like US, the country has enough gas potential to lubricate different sectors of our economy, including gas-based power. But we need suitable policy frame-work to foster expertise,competition, and availability through market driven exploration,production,import,transport,and pricing. Same is the case for coal availability and 'cleaning' the coal-based power. This is where Ministries of PNG and Coal come in to picture and need to be your target rather than RIL and CIL. (5) The last suggestion. As independent director in ONGC Board, you can do a lot to improve the health of lungs of your fellow country-men through higher gas availability. The analysis is very apt. The analysis is very apt. Many are aware of how Reliance Industries is able to influence and manipulate ministries in the government. So the game of gas shortages being played by the company does not seem odd. What is odd is that some, like 'chak' who commented here, are trying to deftly deflect attention from Reliance Industries without bringing to the table any information that can convince us that the company is indeed not playing a dirty game. I appreciate your efforts in sentising Indian public on regulatory loopholes that allow undeclared presence of transfats to seep into various kinds processed food products. You have particularly singled out the packaged "junk food" category. However, in my opinion we may be at a greater risk by consuming the so-called "desi ghee", in particular the unbranded kinds sold in bulk tin cans. These are used used for frying puris, kachoris, samosas, etc, commonly served at the feasts and parties that we attend. Many of these so-called "desi ghees" are suspected to contain varying proportions of admixtures of "vanapasti" i.e., partilaly hydrogenated vegetable oils. CSE would be rendering an equally valuable public service by collecting samples of these from known hubs like Khurja, Aligarh, Hathras or Guntur and having these tested for the presence of trans fat. This is below your standard, Sunita Jee. Just like raising the height of chimneys does not work any longer, talikng coal based power stations out of Delhi will not work. The envoirnment does not know where Delhi begins and where is ends. You have jajjhar, panipat and dari coal based plants bordering delhi. The rationale for gas plants along the gas pieline is well meaning rather than gas plants in Delhi.84% of our electricity is thermal with most of it coming from coal. We do noy yet hav ethe luxary like US of shale gas and first priorty for gas should be transportion,delhi or no delhi. i do not think we have enough gas even for all our transporation needs.So the direction has to be move away from coal, no augmentation of mining whosoever large can meet the needs given that imports can at best be aonly small percentage given the infrastructure needs associated with coal imports and total global transactions in coal. We may not like it but the coal shortage is here to stay.We need to diversigy our fuel options, wind. solar and othe renewables and of course nuclear and hydro all need to be fully expolited.40% of our population has no low levle of electrcity consumption. but thius segment is also not living in a primitive age or having no growth implying the need to discover low energy growth path. Electrcity is very inefficient way of energy consumption. There are "non-electricity" forms of energy consumption. These are not clean at the user end but much cleaner overall and need to be explored.So the demand side managment, energy efficiency are as equally important till other technoligical invoations like hydrogen come in the commercial domain.For any significant development on the hydrogen econmonmy you need high temperatures which can come only from within nucleaus and not from pripeherial electrons.It is not the coal or gas policy but the energy policy that requires attention and near term, mid term & long term solutions which are all different and need to be taken head on now, otherwise as usual it will be late. Conservation in this policy framework for power is vital and prcious little is being done about it. By Substituting vapour absorption ac for vapour compression ac, we can save 65000 MW of electricity, which is the capacity envisaged for nukes. To build nukes you have coal fired plants and hydel plants extra because the construction energy per year for 65000 MW years of energy per year is 45000 to 50000 MW-y per y. Where will you get all this energy but by coal? And year after year!And this programme will last forever because the nuclear power programme consumes much more energy than it ever produces!You may stagger this programme over 60 years but it is an exercise in GHG production and submergence of vast areas under the sea! This is a great news. But it should be known to many people including policy makers, Healthcare personnels, general public , students from the primary level to the graduation level . There should be substantial elements regarding pollution ,causes,effects on health,how to prevent it, new ideas from young minds should be received with more enthusiasm and may be included in the implementation of the ideas so that there will be improvement in the environment and all other aspects of human life and society at large. 1. Even if RIL would have operated at design capacity, gas availability in India is insufficient to feed gas based power plants in/around Delhi and other critically polluted cities. 2. We like it or dislike, coal as fuel is an absolute necessity in India. In stead of focusing on replacing coal, we shall focus on coal cleaning to reduce pollution levels. Sunita Narain always talked sense in the past. This time outdoes herself by talking on the most important factor of our times. Shweta saw the connection between Electricity and the displacement of her families in Jharkhand. The more power needed, the greater will be displacement of tribal families. She has been campaigning to save her communities asking people to save electricity. She along with her studentsÃ”Ã‡Ã– Forum for Environment, Tarumitra so far got promises from over 10,000 students to save 100 watt/hour of electricity a day. This means, the children through their own effort are saving/producing one Megawatt or more every day. Shweta keeps asking her peer group, bureaucrats, teachers, religious leaders and people in general to replace bulbs with CFLs or LED lights. When somebody replaces two bulbs with CFLs, they save over 100 Watts. Can we offer her creativity and enthusiasm as part of the solution? you have done a great work in bringing out this shocking revelation. but is there something we can do to stop this all? The assumption seems to be that RIL is holding the country at ransom. Take a look at the track record of ONGC, and you will find that for the number of exploration blocks this company has cornered, they have nothing to show. RIL is far from being a monopoly. The company is still waiting for govt approval for its sale to BP. At least RIL has found gas. For that they deserve credit. ONGC is the real elephant in the room, which CSE does not see.